George Graham Reviews Ben Sidran's "Blue Camus"
The music world has its share of artists who have long and interesting careers. Ben Sidran is surely one of those. With a background in jazz, Sidran was a key member of the Steve Miller Band back in the 1960s and was co-writer of several of Miller’s tunes such as Space Cowboy. He later moved more into jazz and also got his Ph.D. For a couple of years, he was host of a Public Radio program “Sidran on Record” in which he interviewed a number of notable jazz personalities. Along the way, he has been releasing a stream of solo albums. 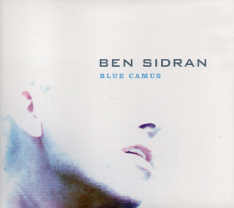 Ben Sidran is out with his 31st solo album called Blue Camus. A keyboard player, composer and and vocalist, Ben Sidran has released music that runs toward mainstream jazz, toward funk and some fusion. In recent years, lyrically, he has been taking on the role of the proverbial jazz hipster with a kind of updated beatnik philosophy. His new album continues the lyrical and mood direction of his last album, Don’t Cry for No Hipster, released in 2013. Sidran writes that Don’t Cry for No Hipster took “a somewhat autobiographical jaundiced view of today’s world as viewed viewed through the eyes of a jazz man who has been around for several decades.” Blue Camus, named after the existential philosopher Albert Camus, “is more the view of the classic hipster, a reader of literature and lover of philosophy, particularly from the bebop era of the 40s and 50s.” So there are literary references and a little beat-style poetry, recited more than sung in spots. But the album also contains some instrumental material. The style context is somewhat similar to his last album, with a small electric quartet playing an often funky beat, with Sidran on mostly electric piano, his son Leo Sidran again on the drums, plus two brothers rounding out the group, Ricky Peterson on organ and Billy Peterson on acoustic bass. Despite the rather intimate sound of the group, the album was recorded in various locales, including in Sidran’s home base of Madison, Wisconsin, in Minneapolis, New York, Madrid, and Paris, where one of the tracks was recorded live. Though the origin of the music is obviously in the jazz world, Sidran has always been one to expand his music outside of the traditional jazz sound. With the electric instrumentation and funky beats, the music can well reach audiences who might not yet be tuned into straight-ahead jazz. In some of Sidran spoken recitations, one could find resonance with rap audiences, at least those open to a bit of philosophy. The CD ends with a tune by jazz pianist Mal Waldron Dee’s Dilemma. Some of the original jazziness is maintained, but the choppy rhythmic groove does not seem to fit the tune particularly well. Ben Sidran’s new album Blue Camus continues his lengthy career of straddling the jazz and popular world, with an interesting mix of lyrics inspired by the literature of the beatnik era, with its jazz backdrop, but served up on this album through a more funk and fusion direction. Sidran maintains his reputation for being the cool hipster, though with a serving of philosophy thrown in, considering the big pictures, rather than the autobiographical stance taken on Sidran’s last album. Musically, Blue Camus takes a somewhat more contemporary direction than the era represented by the lyrics, with a kind of light funk groove permeating, as performed by the understated quartet including a father and son, and two brothers. The album is also, ironically, somewhat less wordy than Sidran’s last album, with the instrumental tracks on the new recording. Our grade for sound quality is close to an “A.” There is decent clarity in the recording, studio effects are held in check and the small group sounds intimate, despite the far-flung set of recording venues. Interestingly, Leo Sidran mixed the album in Paris. The dynamic range, how well the recording captures the ebb and flow of the music, is better than the contemporary average without too much volume compression.